In 1950 an Oklahoma oilman, employed in Michigan, wrote to the superintendent of the Michigan district, Charles W. H. Scott, requesting help in securing a pastor to pioneer a new Assembly in Shelby. Through this contact and faith and prayer, Shelby Assembly of God came into existence. 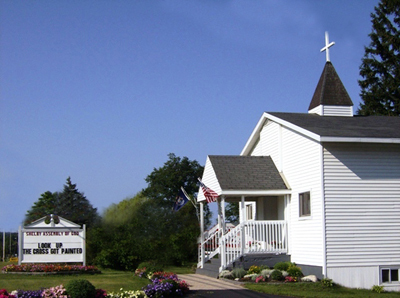 Through the guidance of Brother Scott, R. G. Mohrman was secured to pastor the church. He pastored for six months and left to enter the evangelistic field. Donald Mathews was then invited to pastor the church. 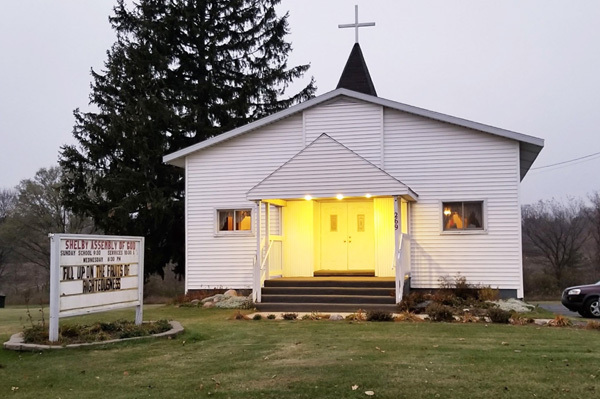 The first year the group met in homes, lodge halls, the district tent and later in the portable tabernacle, a project of the Michigan Christ’s Ambassadors. The portable tabernacle soon became too small and as the Lord added to the church, the pastor urged that a building program be started. The people caught the vision and work was started on this building. About this time, Pastor Matthews felt the Lord direct him to give up secular employment and devote himself entirely to the work of the Lord, even though the church was young and starting a building program. The Lord confirmed his plan during a revival meeting when the majority of the men in the church stood to their feet and promised to start paying tithes in order to support the pastor. Within three months after this, excavation for the basement of the church began on an acre of ground given to the church by Mabel Parsons for that purpose. Less than a month later Sister Parsons made available a parsonage for the pastor. The church, though not fully completed, was ready for services in March, 1953. The first seats for the church came from Greenville, Michigan at a cost of fifty cents a piece.